I have received several questions from readers regarding earwig (Dermaptera) infestations and what to do about it. 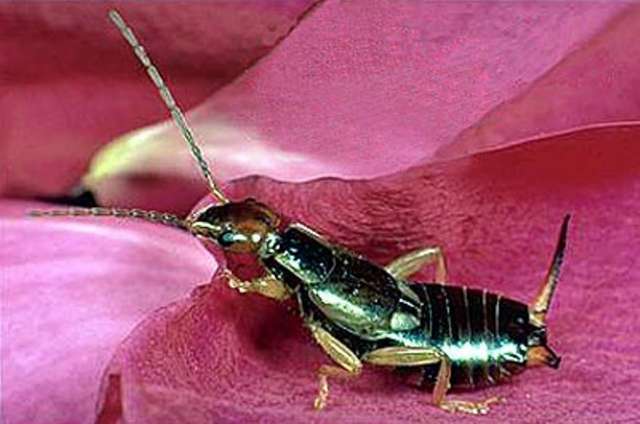 The earwigs invade the plants, hide in the flowers and eat the flowers and leaves. This can weaken the plant to an extent where it eventually dies. Apart from the fact that it is not very nice to see your beautiful flowers eaten, the earwigs emit a foul-smelling liquid when disturbed. The name earwig comes from a European superstition that these insects entered the ears of a sleeping person and bored into the brain. This is an urban myth that has no basis in fact. These insects are menacing looking, but totally harmless in reality. They are not poisonous and generally will not bite or sting humans, except in self defence if caught in your clothes, shoes or similar. Most earwigs found in Europe are of the species Forficula auricularia. This species is omnivorous and feeds on insects, plants, ripe fruit, and garbage. During the day, earwigs like to hide in cool, dark, moist places. They come out of hiding at dusk to begin foraging for food and seek new shelter areas. As moisture-loving insects, earwigs would not normally thrive in our warm climate without the moisture and shade provided by irrigated gardens. Although they can become a nuisance when abundant because of their habit of hiding within flowers and feeding on soft plant tissues, earwigs are also useful in the garden. They act as scavengers of decaying matter and predators of insect larvae, slug eggs, aphids, and other garden pests. Earwigs spend the winter hiding just below the soil surface. In the spring, each female lays as many as 60 eggs in a below-ground nest (upper two to three inches of soil). Upon hatching the young earwigs resemble small adults and remain under the protection of their mother for a short period of time. They must then disperse to new areas or risk being eaten by her. 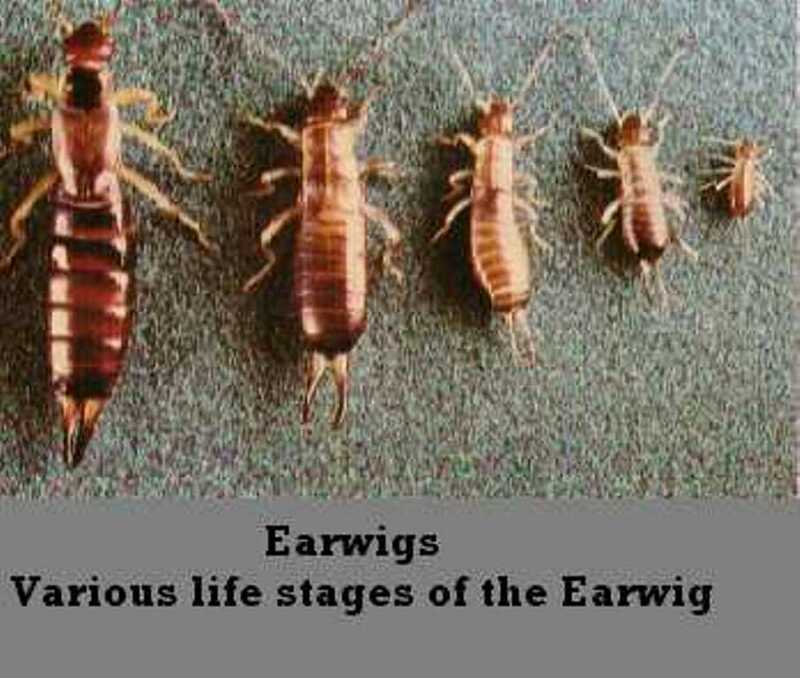 Earwigs reach adulthood in about 70 days. About one fifth of the females lay a second batch of eggs again in autumn. Both eggs and adults overwinter in the soil. 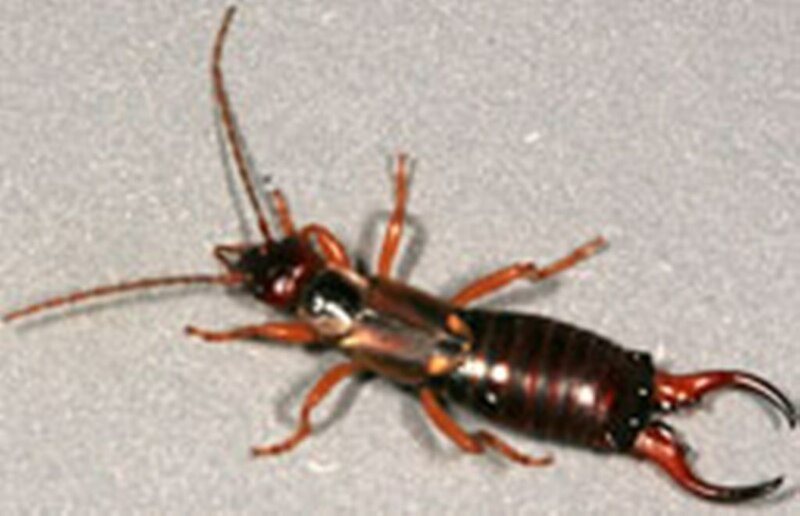 Earwigs may seek refuge indoors when conditions outside are too dry or hot. Sharing your home with earwigs repels most of us, but presents no health hazards. Sweep or vacuum them up and seal entry points. Earwigs usually die indoors because there is little for them to eat. Preventing earwig movement into homes is best achieved by barrier treatments around house foundations. Make sure that water accumulated from roof top areas (Or the overflow from your rainwater barrel) is drained well away from the building foundation. For the same reason keep leaves, wood, compost and other organic material away from the side of the building. Change landscaping by creating a clean, dry border immediately around the foundation wall. Gravel or ornamental stones can make an attractive barrier against earwigs and other pest invaders. Earwig control in the garden There are many insecticides labeled for earwig control, but as our environment is polluted enough as it is, I prefer the �green� approach. If you have an earwig problem in your garden, first pick and throw away all infested flowers. It sounds a bit drastic, but will help getting rid of a lot of the earwigs. The flowers are not very pretty half eaten, anyway. Next, use such non-chemical methods as trapping and baiting. 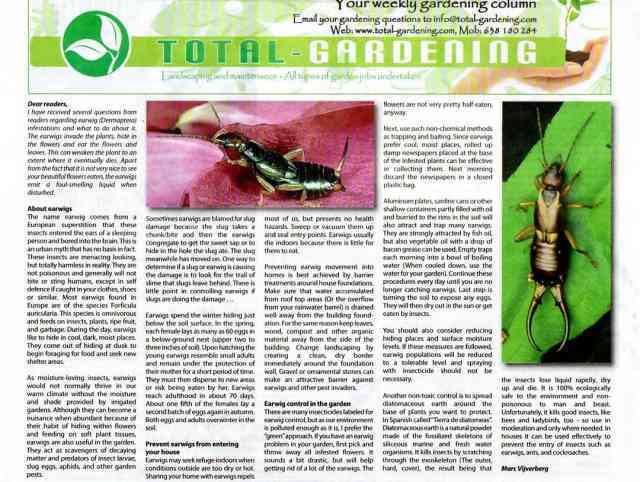 Since earwigs prefer cool, moist places, rolled up damp newspapers placed at the base of the infested plants can be effective in collecting them. Next morning discard the newspapers in a closed plastic bag. Aluminum plates, sardine cans or other shallow containers partly filled with oil and burried to the rims in the soil will also attract and trap many earwigs. They are strongly attracted by fish oil, but also vegetable oil with a drop of bacon grease can be used. Empty traps each morning into a bowl of boiling water (When cooled down, use the water for your garden). Continue these procedures every day until you are no longer catching earwigs. Last step is turning the soil to expose any eggs. They will then dry out in the sun or get eaten by insects. You should also consider reducing hiding places and surface moisture levels. If these measures are followed, earwig populations will be reduced to a tolerable level and spraying with insecticide should not be necessary. Another non-toxic control is to spread diatomaceous earth around the base of plants you want to protect. In Spanish called �Tierra de diatomeas�. Diatomaceous earth is a natural powder made of the fossilized skeletons of siliceous marine and fresh water organisms. It kills insects by scratching through the exoskeleton (The outer, hard, cover), the result being that the insects lose liquid rapidly, dry up and die. It is 100% ecologically safe to the environment and nonpoisonous to man and beast. Unfortunately, it kills good insects, like bees and ladybirds, too - so use in moderation and only where needed. In houses it can be used effectively to prevent the entry of insects such as earwigs, ants, and cockroaches.